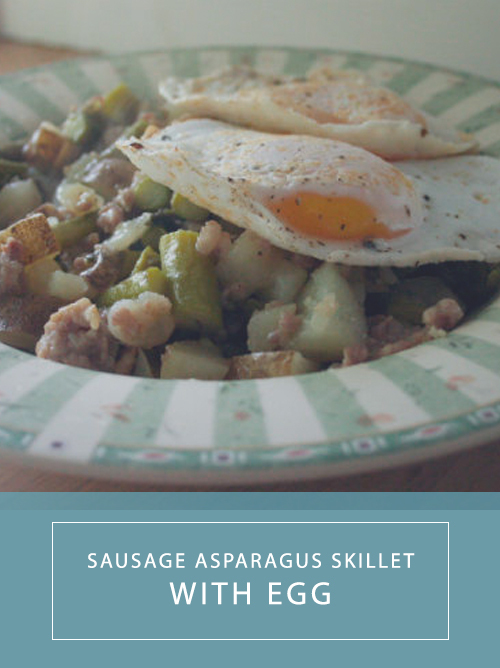 I have made this sausage asparagus skillet recipe from Simply in Season several times over the years, and when I’ve posted it previously it received great reviews. It’s probably the one asparagus recipe that almost everybody likes. So I thought it was perfect to share for this week’s #SundaySupper theme: Eggtastic Recipes. When I was describing the recipe to DH to remind him of it, he said, “that sounds like a breakfast recipe.” It then occurred to me that perhaps the addition of a fried egg or two on top would turn it into even more of a breakfast-y sort or recipe. And so this minor adjustment elevated this simple skillet meal to something I would definitely order in a restaurant. Brown the sausage and onion together in a large skillet. Drain fat if necessary. Add the potatoes, water, salt, and pepper; cook over medium heat, covered, for 10 minutes. Add the asparagus and simmer another 10 minutes. The Verdict: I couldn’t believe how wonderful the runny egg yolk was when sliding into to the sausage and asparagus mixture. It was like a hollandaise sauce effect without having to go to the trouble of making hollandaise sauce. I didn’t even miss the cheese, which I forgot was supposed to be on there until we were halfway through with breakfast. Oh yeah, this is my new favorite way to make this recipe. This is making me hungry–looks delicious! This looks and sounds delicious! And right at supper time too. Y U M ! If there is any asparagus still in season around here I am SO trying that this weekend! Oh, we love fried eggs around here- this sounds wonderful. I have one bag left of our asparagus (I’m letting the bed go to ferns now after two months of picking) and I think my husband will be OK with this. He’s gotten a bit tired of it and is happy to see it’s season end. Adding sausage and egg, though? I bet he’ll love it! Thanks ever so much for hosting this eggtastic Sunday Supper Wendy! Any recipe that starts with a pound of sausage has my immediate and undivided attention, Wendy. It looks great! Thanks for hosting this week! Ha ha, yes, sausage is the secret ingredient! You are welcome! And yes, it’s definitely filling! I love the combination of everything in this Skillet meal. 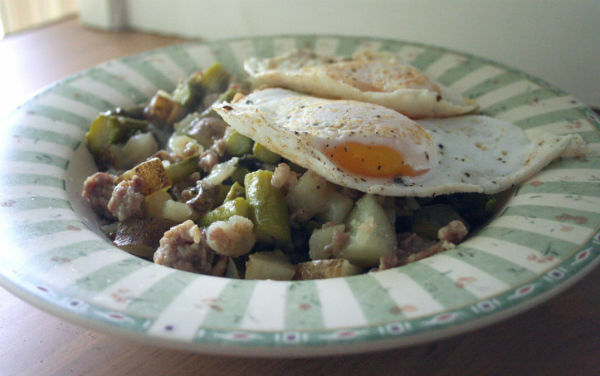 I’m all about skillet meals so I must try this because everything is better with an egg on top! Yes, skillet meals are a favorite! Thanks so much for hosting us this week! Your dish sounds amazing—perfect for a special breakfast!!! You are welcome! It goes together quickly too, which is always a plus! Looks delicious, asparagus is a definite favorite and great with everything else in there. Thanks for hosting today as well! You are welcome, it was fun! Yum! I have actually never used duck eggs before. I will definitely have to try it. Thanks for hosting! I think they are a bit richer in flavor than chicken. Asparagus and Eggs are the best, aren’t they? Love this recipe. Yes, I can’t wait for fresh asparagus from our farmers market! I agree that a runny egg adds so much richness! I love duck eggs and I’ll bet this tastes wonderful together! Oh gosh! You had me at sausage and asparagus! The egg looks fabulous with this. It really does add the perfect finishing touch! Love that egg on top, waiting for the yolk to pop! This looks delicious! Nothing better than fresh asparagus in the spring!